What you can customize: You can personalize your ribbon to arrange tabs and commands in the order you want them, hide or unhide your ribbon, and hide those commands you use less often. Also, you can export or import a customized ribbon. What you can't customize: You can't reduce the size of your ribbon, or the size of the text or the icons on the ribbon. The only way to do this is to change your display resolution, which would change the size of everything on your page. When you customize your ribbon: Your customizations only apply to the Office program you're working in at the time. For example, if you personalize your ribbon in Word, those same changes won't be visible in Excel. If you want similar customizations in your other Office apps, you'll have to open each of those apps to make the same changes. 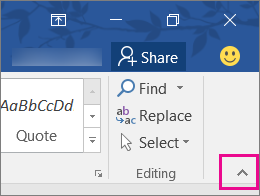 Tip: You can't change the color of the ribbon, or its icons, but you can change the color scheme that Office uses throughout. For more information see Change the Office theme. 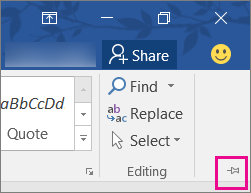 Open the app you want to hide your ribbon in, such as Word or Excel. In the top right corner of the app, choose the ^. Choose a tab, such as Home. When the ribbon expands, in the top right corner, choose the to pin the ribbon to the top so it stays there. If you're using Read mode, press the Esc key to display your ribbon. The tabs on your ribbon are Home, Insert, Design, etc. For example, the picture below shows the tabs in Word. You can add custom tabs or rename and change the order of the default tabs that are built in to Office. Custom tabs in the Customize the Ribbon list have (Custom) after the name, but the word (Custom) does not appear in the ribbon. To work with your ribbon, you need to get to the Customize the Ribbon window. Here's how you do that. 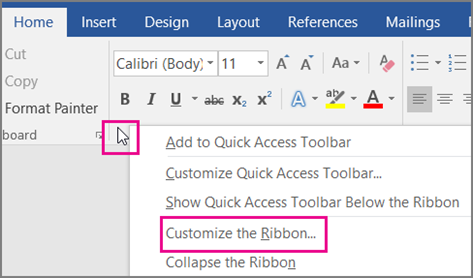 Open the app you want to customize your ribbon in, such as Word or Excel. Place your mouse in any empty space in the ribbon and then right-click. 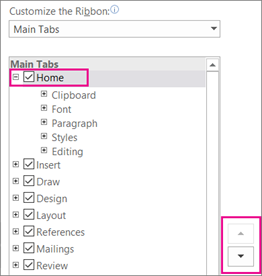 Now you're ready to do the steps below to customize your ribbon. You can change the order of Home, Insert, Draw, Design, and other tabs. You cannot change the placement of the File tab. In the Customize the Ribbon window under the Customize the Ribbon list, click the tab that you want to move. Click the Move Up or Move Down arrow until you have the order you want. To see and save your changes, click OK. When you click New Tab, you add a custom tab and custom group. You can only add commands to custom groups. In the Customize the Ribbon window under the Customize the Ribbon list, click New Tab. In the Customize the Ribbon window under the Customize the Ribbon list, click the tab that you want to rename. Click Rename, and then type a new name. You can hide both custom and default tabs. But you can only remove custom tabs. You cannot hide the File tab. In the Customize the Ribbon window under the Customize the Ribbon list, clear the check box next to the default tab or custom tab that you want to hide. You can hide both custom and default tabs, but you can only remove custom tabs. The custom tabs and groups have (Custom) after the name, but the word (Custom) does not appear in the ribbon. In the Customize the Ribbon window under the Customize the Ribbon list, click the tab that you want to remove. 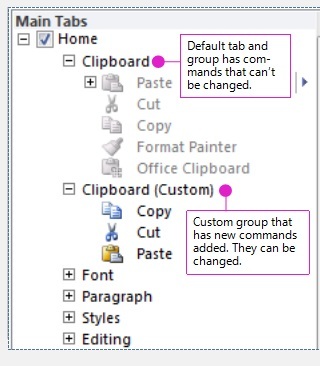 You can add custom groups or rename and change the order of the default groups that are built in to Office. Custom groups in the Customize the Ribbon list have (Custom) after the name, but the word (Custom) does not appear in the ribbon. In the Customize the Ribbon window under the Customize the Ribbon list, click the group that you want to move. You can add a custom group to either a custom tab or a default tab. In the Customize the Ribbon window, under the Customize the Ribbon list, click the tab that you want to add a group to. To rename the New Group (Custom) group, right-click the group, click Rename, and then type a new name. Note: You can also add an icon to represent the custom group by clicking the custom group, then Rename. When the Symbol dialog opens, choose an icon to represent the group. To hide the labels for the commands that you add to this custom group, right-click the group, and then click Hide Command Labels. Repeat to un-hide them. In the Customize the Ribbon window under the Customize the Ribbon list, click the tab or group that you want to rename. In the Customize the Ribbon window under the Customize the Ribbon list, click the group that you want to remove. You can’t remove a command from a group built in to Microsoft Office. However, you can make a custom group with the commands that you want to replace the default group. In the Customize the Ribbon window under the Customize the Ribbon list, click the default tab where you want to add the custom group. Right-click the new group, and then click Rename. Type a name for the new group and select an icon to represent the new group when the ribbon is resized. In the Choose Commands from list, click Main Tabs. Click the plus sign (+) next to the default tab that contains the group that you want to customize. Click the plus sign (+) next to the default group that you want to customize. Click the command that you want to add to the custom group, and then click Add. Right-click the default group, and click Remove. To add commands to a group, you must first add a custom group to a default tab or to a new custom tab. Only commands added to custom groups can be renamed. Default commands appear in gray text. You can't rename them, change their icons, or change their order. In the Customize the Ribbon window under the Customize the Ribbon list, click the command that you want to move. In the Customize the Ribbon window under the Customize the Ribbon list, click the custom group that you want to add a command to. In the Choose commands from list, click the list you want to add commands from, for example, Popular Commands or All Commands. Click a command in the list that you choose. You can only remove commands from a custom group. 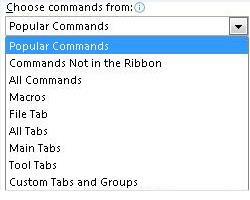 In the Customize the Ribbon window, under the Customize the Ribbon list, click the command that you want to remove. In the Customize the Ribbon window under the Customize the Ribbon list, click the command that you want to rename. You can reset all tabs to their original state, or you can reset select tabs to their original state . When you reset all tabs on the ribbon, you also reset the Quick Access Toolbar to show only the default commands. In the Customize the Ribbon window, click Reset. You can only reset default tabs to their default settings. In the Customize the Ribbon window, select the default tab that you want to reset to the default settings. Click Reset, and then click Reset only selected Ribbon tab. You can share your ribbon and Quick Access Toolbar customizations into a file that can be imported and used by a coworker or on another computer. In the Customize the Ribbon window, click Import/Export.